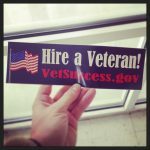 Proud to have been able to help out at the Veteran’s Career Fair today in Wilmington, NC at the CFCC Schwartz Center. It was a good feeling to do resume critiques and help out these tremendous group of people. Without their sacrifices, we wouldn’t be able to feel safe outside our homes and have this ability to mobilize, interact and network with others. Thank a Veteran always!